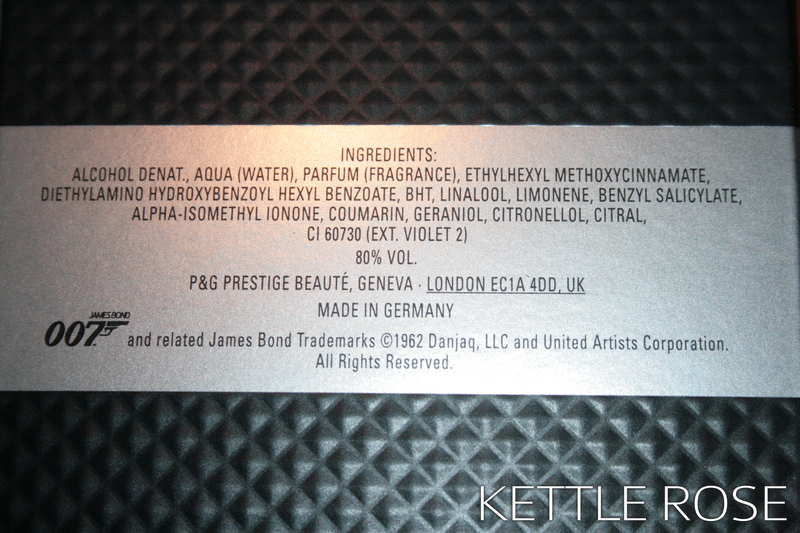 PRESS RELEASE: James Bond 007 Fragrance Now Available In LE Packaging! Gold can be so hot at a time the weather is so cold. Usually reserved for holiday attire, this season’s go-to metallic hue is now in fragrance form. 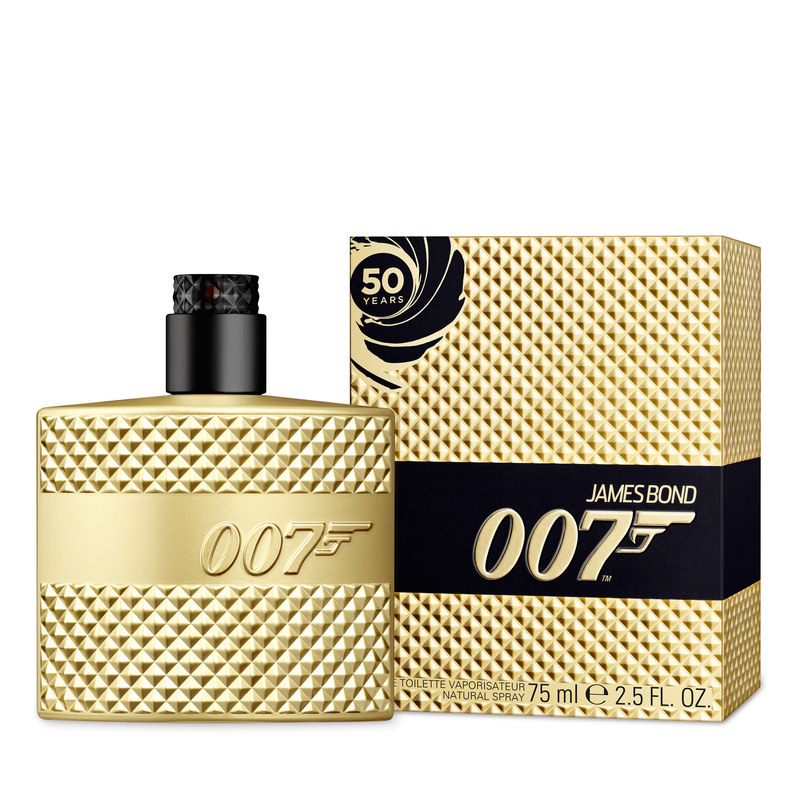 There is no better way celebrate the coming New Year and 50th anniversary of the beloved James Bond film franchise with the James Bond 007 fragrance. 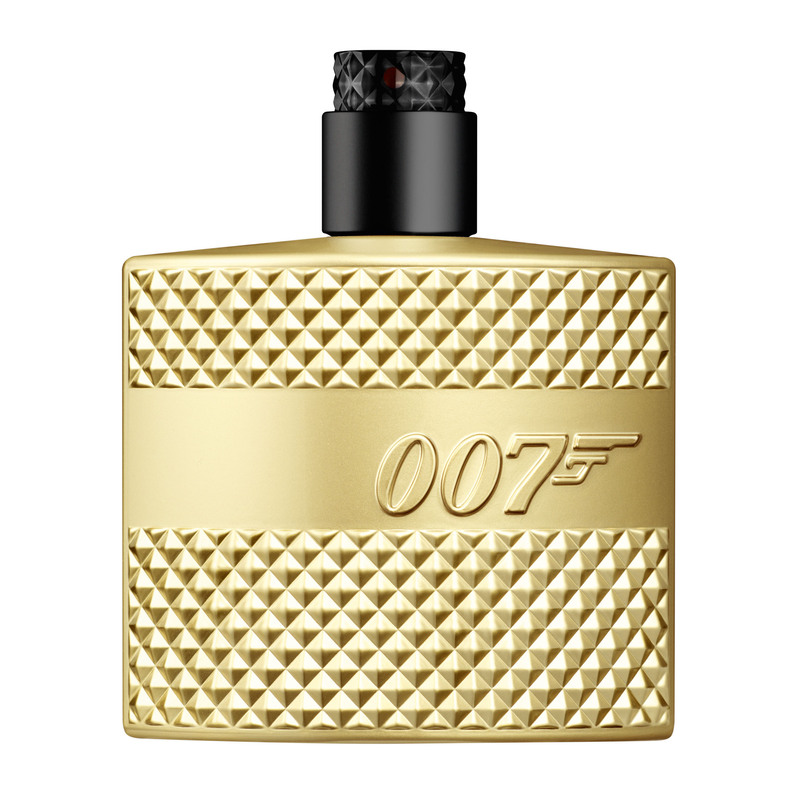 Diamonds are forever, but tomorrow never dies when this gilded covered scent is worn by the ultimate Bond man. The fragrance, now available in the limited edition gold bottle, is the perfect complement to the holiday season and fast approaching New Year. 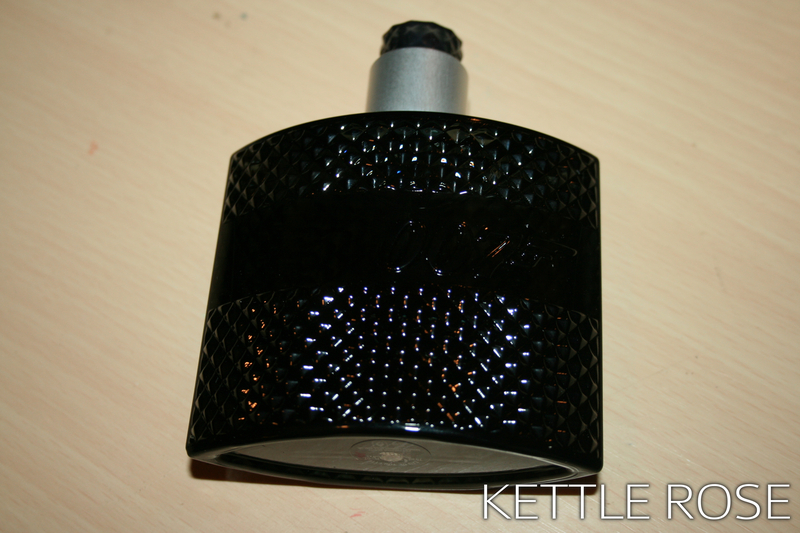 Still housing the same scent from the original bottle, this luxurious and sleek bottle kicks the decadence up a notch. Isn’t this packaging super luxe? I love it. So decadent, and just like the original bottle, the fragrance inside, which I reviewed here, is just so Bond. It’s James Bond to the core, and now we can all pretend that we know what Daniel Craig smells like. Mmm mmm mmm. PRICING | $40 for 50mL, making it a holiday “Gift Under $50. That’s the last one for tonight, so HAPPY NOT-THE-END-OF-THE-WORLD GUYS! Hello everybody! So a quick (but relevent) update on my off-blog life. I’ve been super busy. I have three jobs and hopefully another (extremely exciting!) job offer to replace one of my current ones. One of the three jobs I have is Bath & Body Works. Now, Bath & Body probably don’t want people blogging about their stuff while under their employment, so I won’t. But I love the job and the products – especially the upcoming Forever Red (in stores Nov. 5th – go buy it!). Now, I’ve never been too good at telling the individual notes in a fragrance aside from sandalwood – why sandalwood, I’ll never know – but I’m getting better. 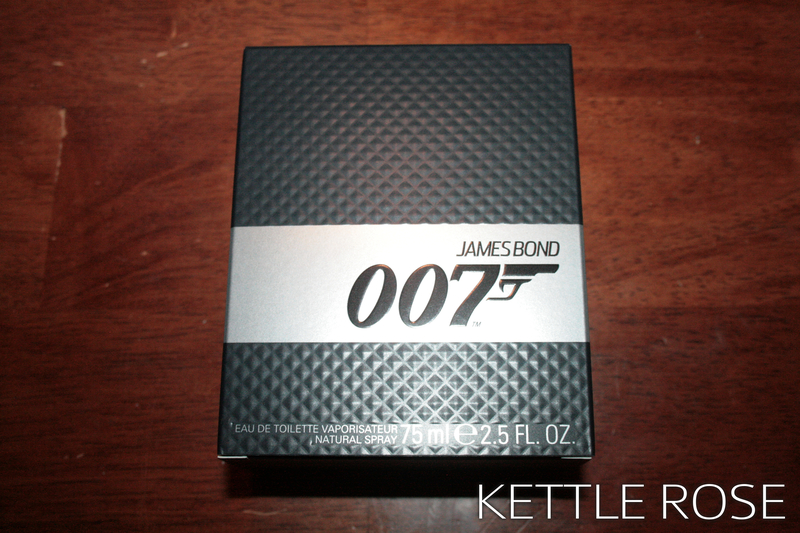 I’m comfortable enough in my Scent Sniffer Skills to properly review a most proper fragrance, James Bond 007. Now the super spy is an icon for a thousand different reasons, including his girls, suits, and drinks, but I’ve always wondered what he smelled like. 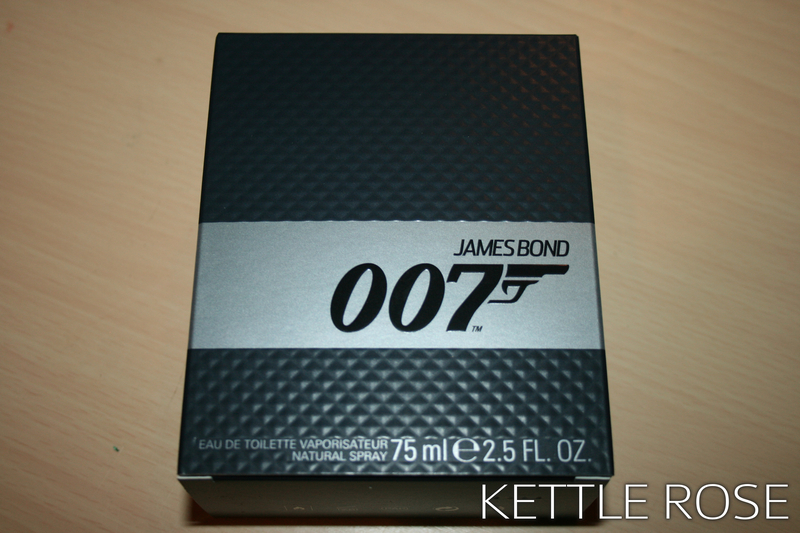 But thanks to this scent that coincides with the third installment in Daniel Craig’s James Bond series, SKYFALL, us ladies (and some men) will never have to wonder again! Let’s get to the review, I’ve babbled enough. First I’m going to talk about the packaging. I received the sample in a slim black shipping box, with black tissue paper, with the the perfume box laying safely and simply in the center. It was so sleek, I kept the box. The perfume box itself is a work of art itself. It’s a semi-matte carbon (not quite black) quilted cardboard with a metallic silver banner around its middle. The silver banner is emblazoned with the classic logo that anyone would recognize. Now, this is an Eau de Toilette, which means that there’s less fragrance oil in the formula, making it less strong than an Eau de Parfum, which is usually too strong for me. This is also obviously a spray nozzle, and the bottle contains an estimated (that’s what the “e” stands for, I think, if my research is correct.) 75mL, or 2.5 fl oz. The back of the box lists the ingredients, for those with any skin concerns. It also lists licensing and other legal stuff. Okay, so this picture is from the press release because, while I’ll still post them, my pictures don’t do this bottle justice. In products, and especially the beauty industry, most of the money you spend is paying for the packaging. Meaning that the ingredients inside your mascara aren’t too different, whether it’s CoverGirl or Dior. But you pay for the name. So I judge packaging extremely – it matters. This cologne hit the style of Mr. Bond on the head. The glass flacon is a dark, dark blue, maybe leaning teal. It’s got the diamond/quilted pattern with raised facets, which allude to the handle of a pistol, or according to the press release, “takes inspiration from the magnum meshing texture found on an array of Bond’s slick automobiles.” These facets catch the light perfectly, as seen above, and is probably one of the most amazing parts of this bottle, it feels good in your hand. I just brush my fingers on it continuously, as if I were actually feeling up James Bond himself, you just get that feeling. Holding this bottle makes you feel luxe. Holding something that has an embossed 007 logo on it is that awe inspiring feeling of holding something you’ve waited so long for and finally got it. It’s pure satisfaction. You’re holding 50 years of film culture in your hand. 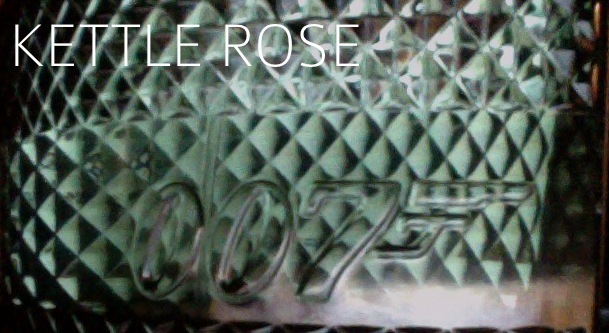 The bottle has a middle section of smooth glass with a “subtly embossed” 007 logo, “a global emblem for dangerous sophistication,” that creates a beautiful 3D effect, which isn’t a highlight on the press release, and is extremely hard to photograph. You can see it in the PR picture above, and below, in these not-so-great pictures I got that finally showed off the 3D effect and color of the bottle. The bottle really is dark blue. I told you! And the outward curve of the back and front create a 3D effect. Now onto the nozzle and cap. I thought the silver and black cap was just that, a cap. 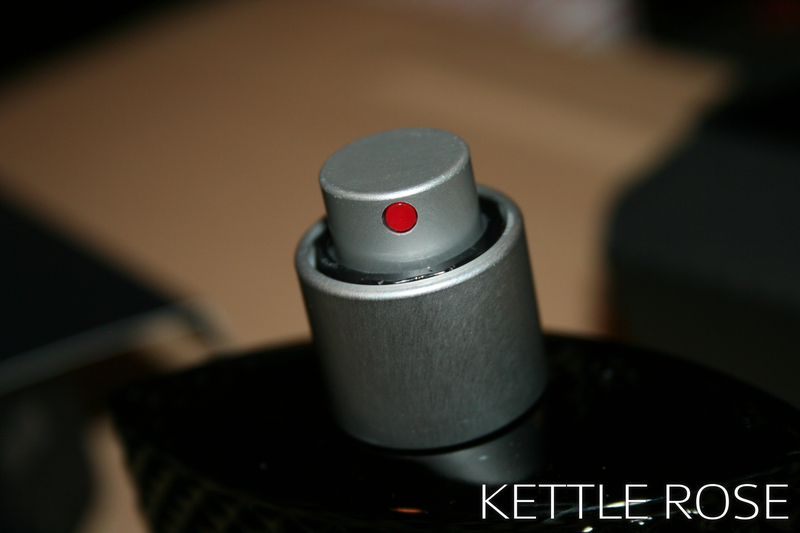 No, it’s actually a twist cap that lowers the black part down and reveals the red spray nozzle. 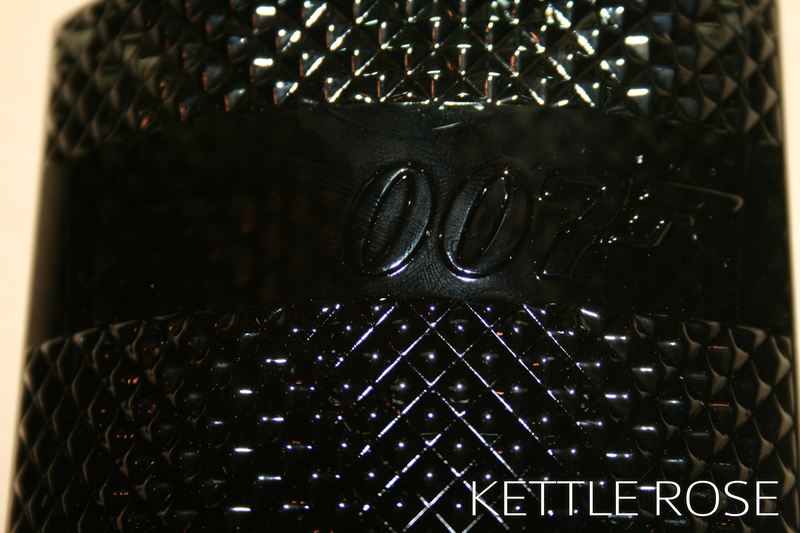 The press release says “the silver “twist” cap which reveals the fragrance nozzle is a nod to Bond’s indispensable, state-of-the-art gadgets.” It does feel spy-ish, if that makes any sense. 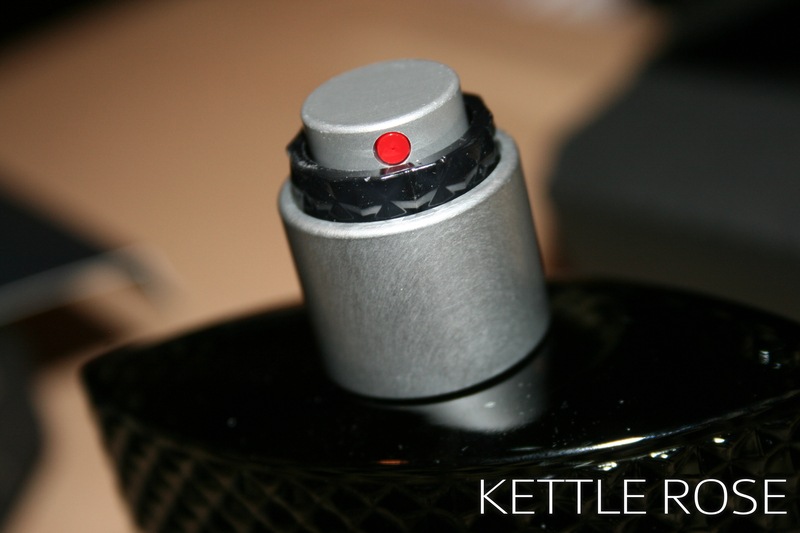 On my bottle, the black and silver parts on the cap is plastic, and sometimes the black part will take a second to twist down all the way. Okay, so I think the lower silver part is maybe metal, it’s hard to tell by tapping, but it is cool to the touch, so I think so. The nozzle button is definitely plastic though with a red nozzle “eye.” I love the one little ode to color, one teeny speck of red that adds a little danger to all the sleek packaging. All the way down! So awesome. Vetyver , a Haitian ingredient bring undeniable power and strength blended with sensuality, captures Bond’s charming and refined characteristics. Crisp apple, the quintessentially British ingredient known for its fresh flavor, reflects the smooth side of Bond, and adds a refreshingly light quality that perfectly harmonizes the heady Fougère. Sandalwood offers a full bodied essence which creates the fragrance’s long lasting and powerfully masculine qualities. The first thing that catches me is the sandalwood and apple combination. While the vetiver is detectable, it’s the apple and sandalwood that pick up best on my skin, while my brother definitely picks up more of the vetiver and Fougère. I’ve been wearing this for about two weeks now every other day or two, and I get compliments on it quite a bit, about four or five times a day. This is a masculine scent, but I’m not afraid to wear it, nor should any other woman be. I’ve smelled women’s perfume more heady and masculine than this. For men, this is perfect. You can get them to smell good, and they can go on pretending they’re James Bond every time they take a corner too fast in the car. The sleek packaging makes it a vanity-top must have. It’s a work of art. I can’t say it enough. 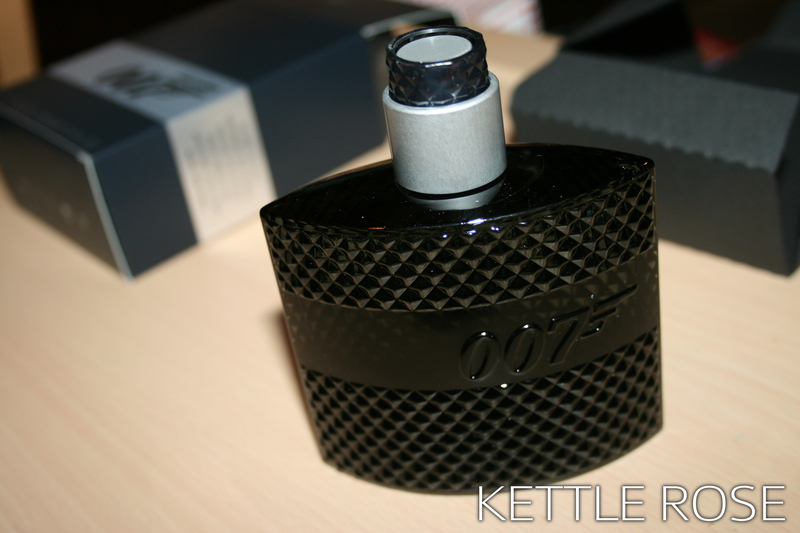 But when it comes down to it, this fragrance delivers on it’s promise; this is James Bond in a bottle. For the first time in your life you can be James Bond for just a moment, before you have to open your eyes and face the real world and realize, sadly, we cannot jump on the back of a moving train, stand up, and calmly fix our cufflinks. 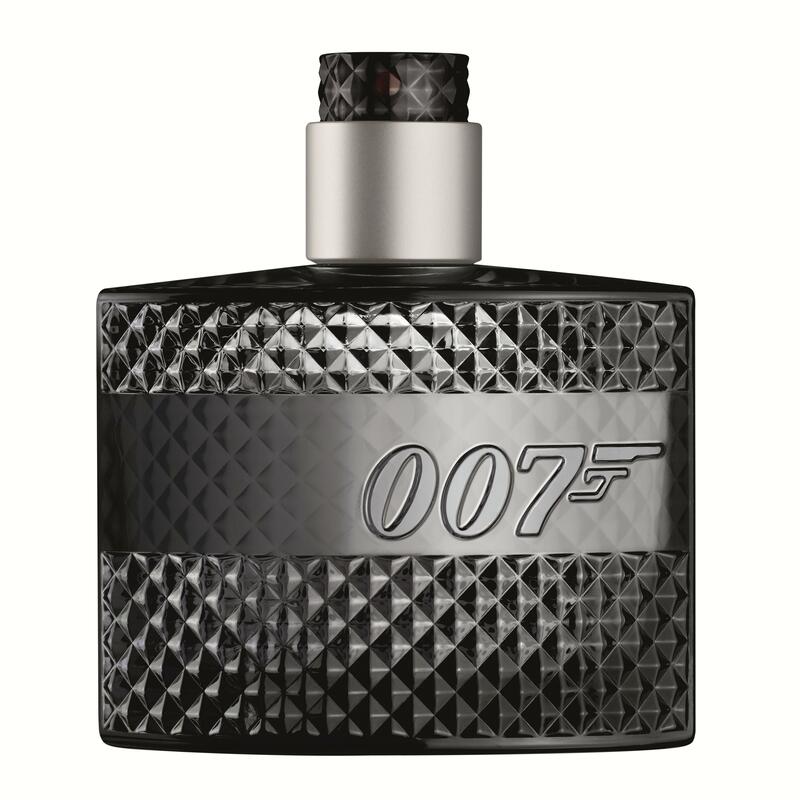 So, James Bond 007 will hit your nearest Kohl’s and online at http://www.kohls.com starting October 17th. And while your at it, go see SKYFALL, hitting theaters on November 9th in the US. Bed now, I loved doing this review! Diamonds are forever, but tomorrow never dies with the James Bond 007 fragrance. This signature scent releases your inner-Bond with its fusion of traditionally authentic and unmistakably British ingredients that give the classic fragrance a modern twist. The must-have scent for the 21st century contemporary man embodies the duality of Bond – irresistible sophistication blended with uncompromising masculinity. Available at Kohl’s and http://www.kohls.com. This fragrance is available in Canada exclusive to Shoppers Drug Mart. Hey guys! I just got this in the mail today, stay tuned for a review!